A gorgeous, holiday villa in Phuket near Natai beach, Villa Nandana is a luxurious retreat for guests looking for a good time beside the beach with stunning ocean views. Fringed by palm trees, the tropical gardens speak volumes of the way in which the villa has been designed to infuse opulence with abundant nature. Prepare yourself for the most memorable trip as you bask under the tropical sun beside the private swimming pool or head to sandy beach for a relaxing day beside the ocean! A blend of traditional Thai design with modern comforts, this four-bedroom villa is the perfect place to experience the best of both worlds. There are four, stunning bedrooms at Villa Nandana, of which the master bedroom is the most spacious with wooden interiors opening out to the pool directly and also offering mesmerizing ocean views. Furnished with a king-sized bed, laden with traditional bedding, as well as quality white linen, the bedroom is also equipped with a massive flat-screen and a chaise. The en-suite bathroom is another surprise with a bathtub, and other amenities. The three guest bedrooms are spread across the two-storey villa, each leading to a private garden or a terrace. They are air-conditioned and furnished with king-sized beds, two of which can be converted to twin beds. For your convenience, each bedroom comes with an en-suite bathroom that is well-equipped. With towering palm trees billowing in the wind, the free-size swimming pool at Villa Nandana runs the length of the beach out front. Separated by tropical gardens with plenty of foliage and flowering plants, guests are offered direct beach access for a wonderful time. 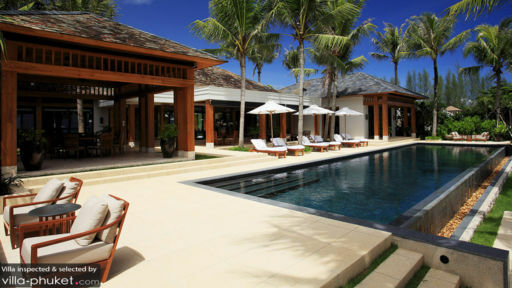 Accompanying the swimming pool is a pool deck which has been fitted with several sun chairs and parasols where you can unwind and relax under the tropical sun. An alfresco lounge is found on the garden with comfortable seating and, of course, an ocean view! The villa is nothing short of a dream with meandering ways that have lotus ponds, corridors designed to bring in the outdoors inside, and verdant tropical flora wherever you turn. To enjoy all this, all you need to do is step out and walk around for a refreshing time. 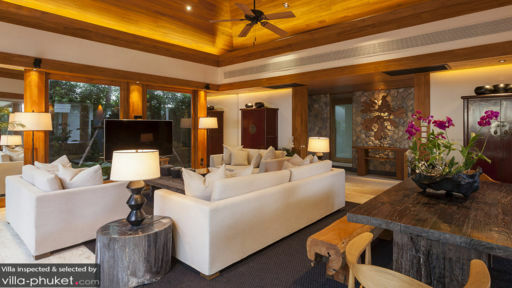 When you wish to rest, the luxurious and well-designed living area at the villa is the perfect communal space. Furnished with elegant white sofas, the living room features a high-pitched traditional Thai ceiling and wooden interiors. The opulence is quite apparent owing to the warm lighting emanating from glass lamps and quality furnishings. The view from the sofas across the open-sided walls is one that will leave you breathless; Miles of sand and the endless ocean lie right under your nose and all you can do is bask in all its natural splendour! Villa Nandana offers quite a few ravishing options for dining to guests and these include an alfresco, dine under the star, situation with a round table found beside the pool facing the ocean. There is another indoor setup with a handcrafted wooden dining table for a more intimate dinner. A fully-equipped kitchen fitted with the best of western facilities is also at your disposal! A fully-staffed villa is the best kind as everything from housekeeping to security is taken care of by professionals. Personal guest assistance is a right boon as everyone has their needs and requirements catered to. Car rentals are available as per request! For the best experience, Villa Nandana offers a fitness room with gym equipment and spa facilities for in-house massages and therapies at extra cost. 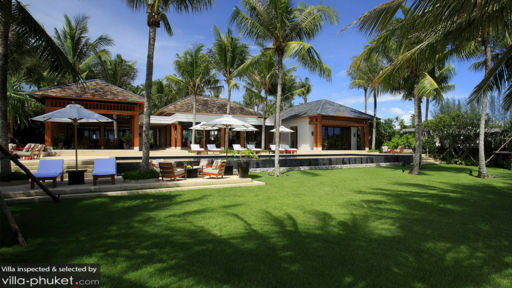 Since the villa is located near Natai beach, guests are at an advantage as they can easily walk to its sandy shores. Once there, for miles ahead all you see is pristine white sand stretching for over 10 km! There are not many tourists and related attractions in the area making it completely free from the hustle and bustle of otherwise over-populated beaches. Relax and take a stroll or simply lie on a beach towel as you enjoy the tranquility and peace afforded by this particular sandy shore!